Golf, beaches, fishing, southern cooking are hallmarks of this fantastic state. But there's so much more including cities like Charlotte, Raleigh Durham, Asheville, and Wilmington where you can find arts, culture, and tons of movie sites too! For generations, people have escaped to the mountains of North Carolina to avoid the stresses of everyday life. While some settled here in the mountains permanently and become the subject of legend and myth, others come here with the intention of resetting, recharging, and reconnecting with what it means to be man in a society that is ever changing. These mountains possess untold beauty all year round but are especially enjoyable in the summer and fall. Whether you are looking for fishing, hunting, craft beer, artisanal food, or just fresh air - it's all hear and ready for you to take your share. Visiting a favorite stadium, birthplace, or hall of fame is something that most sports fans dream of doing at some point in their lives. For most sports though, there is an inherent challenge with that since everything is so spread out. For instance, while Cooperstown might be a great place for baseball fans - it's nowhere near a major league stadium. With NASCAR in particular, Charlotte is THAT PLACE. Not only is this the home of one of the finest NASCAR tracks that I've ever visited - but they also host the NASCAR Hall of Fame, team garages, parts and technology innovators, and you can even follow in the footsteps of racing legends like Dale Earnhardt by visiting his hometown. The mountains of North Carolina have a rich tradition of producing whiskey and frankly trying new things to produce a unique product that other distillers may consider unconventional. While it is unlikely that you'll ever be able to hike out in the woods and see how illicit moonshine is made, this is the next best thing... maybe even better! Pinehurst is one of the single best destinations in all of North America for a guys-only getaway. Founded in 1895, the course has played host to many historic events in its nearly 120 years of existence. Three separate hotels and a bevy of villas and condos await visitors, who have immediate and access to eight top-notch golf courses. The entire area takes up a little over four square miles. 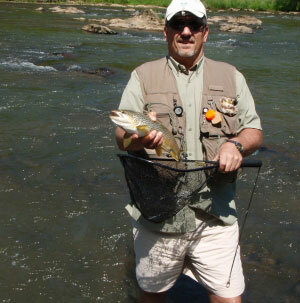 If you have never been, fly fishing is as much an art form as it is a sport. While virtually anyone can stick a lure in the water and drag it behind the boat, fly fishing, IMO, requires even more understanding of your environment and brings you closer to nature - it is just you and the fish right there in the stream together. There are trails of all sorts in this wonderful country, but North Carolina has created the Western North Carolina Fly Fishing Trail in the gorgeous Blue Ridge Mountains. If you love fishing and you love being out in god's country then you must at some point in your life visit this area. One of the spots you should visit while in the area is the High Hampton Inn. Located in the heart of the new Western North Carolina Fly Fishing Trail, the High Hampton Inn now features their very own fly fishing school! Being the only trail of its kind in the U.S., fishermen can experience peak fishing in an area with temperatures that are generally 15 degrees cooler than lower-lying regions because of the 3,600-foot elevation.